Beautiful You: #CountdownToChristmas Week 1 | My Christmas Wishlist! #CountdownToChristmas Week 1 | My Christmas Wishlist! It is time for the next instalment of #CountdownToChristmas and I'm quite excited about this specific one. 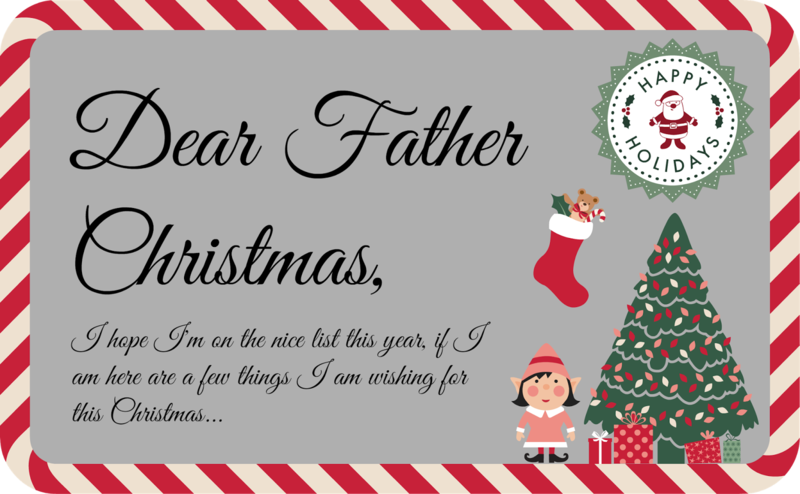 It is our Christmas Wishlist in the form of a letter to Santa, as a child I would always look forward to this moment when it came to Christmas and we thought why not bring some of that spirit back! I hope you enjoy seeing what I'm asking for and leave me some comments below with what you've asked for this year! To be honest, I don't really ask for many presents at Christmas because all of my family tend to be really good at buying me gifts, especially my sister! I just love spending the actual day with my closest family and giving other people gifts! I hope you have enjoyed this short blog post and I'm sorry it wasn't longer but I really haven't asked for much this year. Considering I have just been to New York that was quite an amazing experience and I can't ask for much else this year!